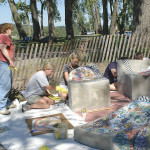 The newest community art project on the St. Croix River Valley Art Bench Trail (www.artbenchtrail.org) will be unveiled on Wednesday, May 30, at 4:00 p.m., in Pioneer Park, Stillwater, Minn. The public is invited to this free event. 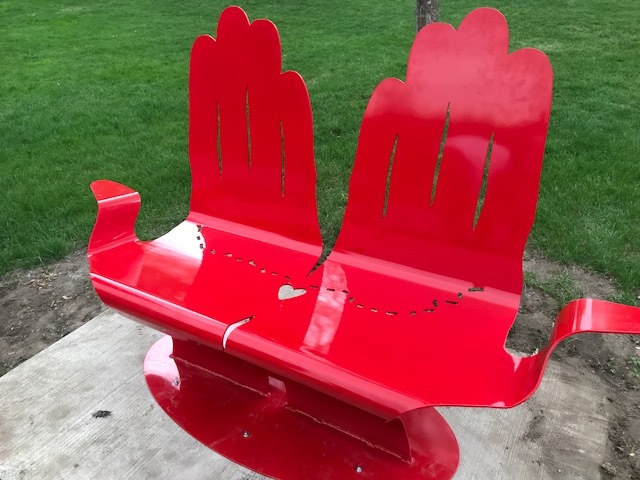 The Art Bench, titled “Couldn’t Have Done It Alone,” is in the shape of a pair of hands, painted bright red, and with a cutout heart and path of the river on its seat. The bench was designed in 2016 by Stillwater Middle School students Bella Anderson, Mia Eliasen, John Finney, Tessa Johansen, Tate Johnson, Nick Nguyen, Belle Rhoney, Lilly Sample, Mac Schlenker, Hannah Sween, Clarice Vrambout, Keenan Walker, and Eleanor Wilhelmi, along with art teacher Megan Beadle and local artist Julia Kaemmer. The final design concept was developed in 2017 by the students and artist Allen Christian (www.houseofballs.com). Working on the new Stillwater Art Bench project opened the eyes of the 13 student artists to their hometown and to the people who care for their neighbors. The bench is dedicated to longtime St. Croix Valley Red Cross employee Jan George and celebrates her more than 30-year career of helping people, and her belief that we are most effective when we work together. It was George who suggested the bench include joined hands as a symbol of teamwork and cooperation. It was the middle school students as well as the artists and teachers working with them who brought the bench to reality. “Together we make a difference, alone we don’t,” George says. Just like George wanted the bench to celebrate the many people in the community with whom she had worked, the students practiced collaboration to come up with a design. They wrestled over competing ideas, driven by their goal to celebrate someone who inspired them from the moment they met her. Through George’s eyes, many stories, and adventures throughout the St. Croix Valley, the group gained a new appreciation for the place that is their home. “Couldn’t Have Done It Alone” was funded in part by Andersen Corporation, Fred C. and Katherine B. Andersen Foundation, Hugh J. Andersen Foundation, HRK Foundation, SRI, and St. Croix Valley Foundation, and was made possible with support from ArtReach St. Croix, City of Stillwater, Franconia Sculpture Park, Leo’s Grill and Malt Shop, The Phipps Center for the Arts, Red Cross Nurses, River Market Co-op, Science Museum of Minnesota, St. Croix National Scenic Riverway, Stillwater Middle School, Washington County Historical Society, and Youth Conservation Corps. The Art Bench Trail is a partnership of The Phipps Center for the Arts, the St. Croix National Scenic Riverway, and the St. Croix Valley Foundation. For more information, contact Anastasia Shartin, Visual Arts Director of The Phipps Center for the Arts, ashartin@thephipps.org, 715-386-2305, ext. 103. Learn more about the waves of migratory birds passing through the St. Croix Valley each spring by joining in the International Bird Migration Celebration May 8 and 9. Events are planned at a variety of locations along the St. Croix Flyway the 8th and 9th, and throughout the summer. A lead up event “Poets on the Wild Side” will be held at the Watershed Cafe in Osceola on Wednesday evening, May 6. The Bird Migration Celebration kick-offs at the Phipps Center for the Arts in Hudson with a reception and program. The program featuring Ben Twaites begins at 7 p.m. Ben is a nature photographer who developed a nature photographer program, “In a New Light” at Northwest Passage, a resident facility for emotionally troubled teens. Hands-on, family friendly activities providing information and education about migratory birds are planned at a number of locations in the St. Croix Valley. Activities will be held in the morning. All locations will also include a variety of activities. Highlights at each event include photographing birds, a workshop at Wild River State Park, in collaboration with Interstate Park. Bird banding will occur at Warner Nature Center and at the Wisconsin Campus of Carpenter Nature Center south of Hudson (Troy Township). A Story Book Nature Walk will highlight activities at the Great River Road Visitor Center/Freedom Park in Prescott. The reception and program on Friday and The St. Croix Flyway Bird Migration Celebration activities are sponsored by Tropical Wings, a group of citizens supporting the Sister Park partnership between 13 US national parks of the Upper Midwest and 7 parks and protected areas of Costa Rica’s Osa Peninsula. The Costa Rican parks and partners held the 2nd annual bird celebration in March, as birds were beginning their migration north. This is Tropical Wings’ 2nd bird celebration in the St. Croix Valley. Watch for more details and visit www.artbenchtrail.org/events/tropicalwings as information becomes available. Contact Judy Freund at 715-386-9336. The eighth bench on the St. Croix River Valley Art Bench Trail will be unveiled on Saturday, September 6, at 1:00 p.m. in Mill Pond Park in Osceola, Wisconsin. This unveiling will take place as part of Osceola Community Days and the annual Wheels and Wings event. A craft fair with food vendors will be in Mill Pond Park that day from 9:00 a.m. to 4:00 p.m. For more information on Osceola Community Days, go to www.osceolacommunityfair.com, for information on Wheels and Wings, go to www.wheelswings.com, and for information on the Art Bench Trail, go to www.artbenchtrail.org. Under the leadership of artist David Markson and Osceola teacher Amy Klein, twelve 3rd through 8th grade students designed this bench during a four-week summer school class organized around the question, “How was the river shaped and how has the river shaped us?” They met face-to-face with National Park Rangers, citizens concerned about the preservation of natural habitats, the village administrator, local businessmen, and volunteer historians. For further information, contact Anastasia Shartin, visual arts director, at 715.386.2305, ext. 103. The community art projects that make up the St. Croix River Valley Art Bench Trail will be a hub of activity in the coming weeks with events and activities, including performances and hands-on activities, taking place at several of the Art Bench sites. The Art Bench Trail is a program of The Phipps Center for the Arts in Hudson, Wisconsin. 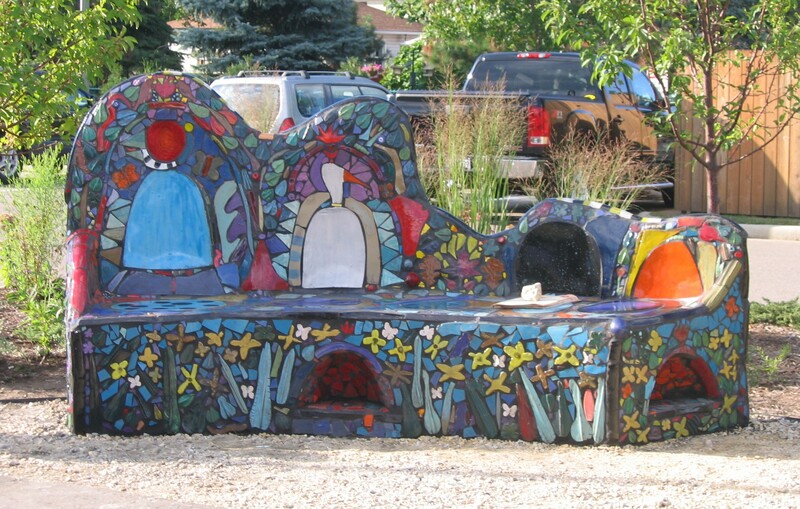 Hudson’s “River Bench” will be included in the community’s annual RiverFest, a celebration of the St. Croix and encouraging volunteer stewardship of the river. The festival, coordinated with the larger River Awareness Week, runs July 12 – 17. 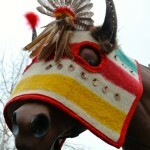 Go to www.stcroixriverfest.org for a complete list of events. 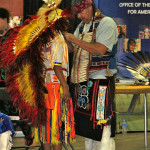 On Tuesday, July 15 from 6:00 to 8:30 p.m., gather by the river for a Native American celebration. 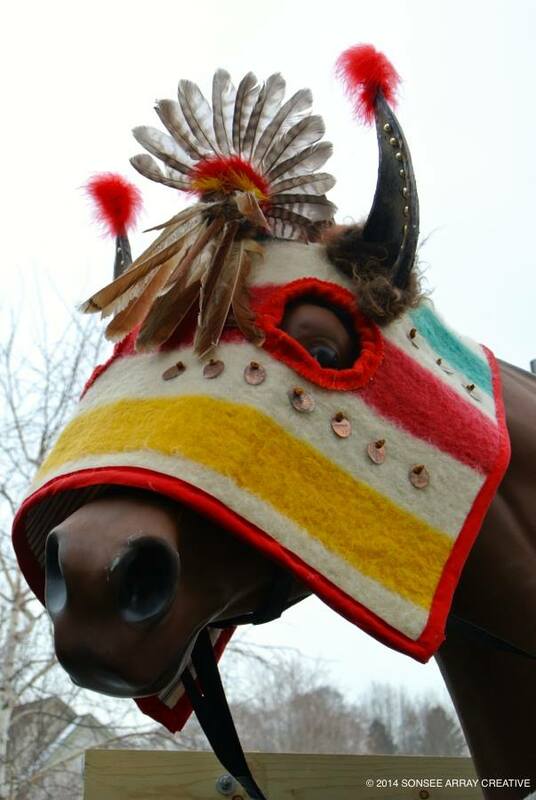 Meet Medallion the Stallion, a life-sized horse sculpture traveling to pow wows and other community events throughout the region this summer, for hands-on activities and to learn about the important role of horses in Native American history. Enjoy a performance of traditional Native American dance by the Traditions Respecting American Indian Life Styles (TRAILS) Dance Troupe at 7:00 p.m., and create river-themed art projects including a “river stick” to bring to RiverFest’s culminating concert on Thursday, July 17. TRAILS Dance Troupe began in 1996 and has over 30 dancers ranging in age from 4 to 17. The troupe has performed extensively at schools, festivals, parades, and other community events throughout Wisconsin, as well as at the 2002 U.S. Winter Olympic Games in Salt Lake City, Utah, and on tour in Japan in 2004. This event, which is presented by The Phipps in partnership with the Hudson Area Library, is free and open to the public. In the case of rain, the event will be held in the Black Box Theater of The Phipps Center for the Arts. 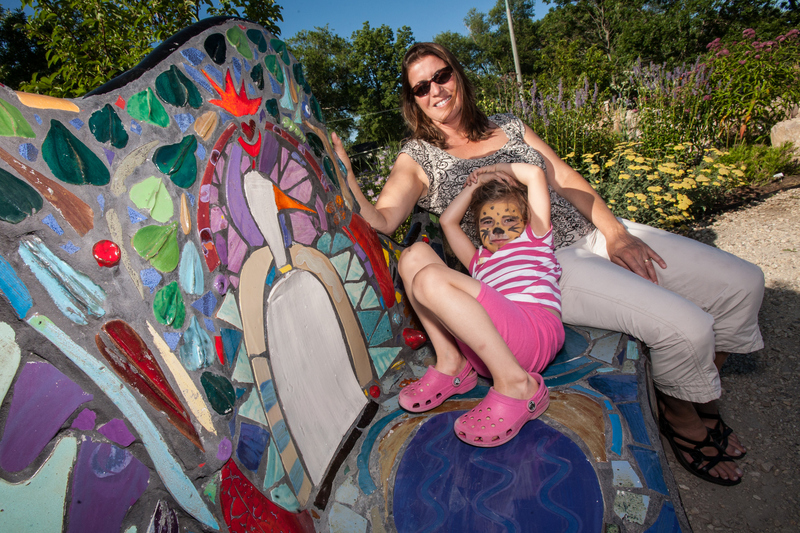 On Saturday, July 12, at the “Butterfly Bench” in Freedom Park, Prescott, Wisconsin, students age six and older are invited to “Paint a Flying Flower.” The bench is located in the park’s butterfly garden, full of butterfly-friendly blooms. Teaching artist Susan Carmody will show participants how to capture their own digital images of butterfly garden flowers and butterflies and then paint a “Flying Flower” on canvas to bring home. Hands-on activities also include a butterfly hunt in the flower gardens, and games. This event is free for the first 16 participants by calling 715.262.0104 to register. Future events at the Art Benches include a tea party at “Kindness is Key,” the art bench at Croixdale, a senior housing center in Bayport, Minnesota, on Tuesday, August 12, from 6:00 to 7:30 p.m., co-hosted by the local Girl Scout troop; a free art making activity at “Settler’s Rest” in Marine on St. Croix during the Marine Art Fair, Saturday and Sunday, September 20 and 21; and drop-in participatory bird drawing sessions with demonstrations led by River Falls artist Vera Ming Wong at the “Junior Girl Scout Nature Bench” at Carpenter Nature Center in Hastings, Minnesota, on Saturday, September 27, from 11:30 a.m. to 3:00 p.m. during the annual Raptor Release event. In addition, throughout the summer, people of all ages are invited to visit the seven Art Benches and use their camera as a passport to enter a drawing for free tickets to performances at The Phipps. 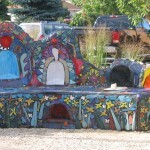 Simply upload photos from each bench at www.artbenchtrail.org. Photos may also be emailed to photocontest@artbenchtrail.org. The Art Bench Trail provides easily accessible opportunities for families to explore the area and experience community art. For further information, contact Anastasia Shartin, The Phipps Center visual arts director, at 715.386.2305, ext. 103. 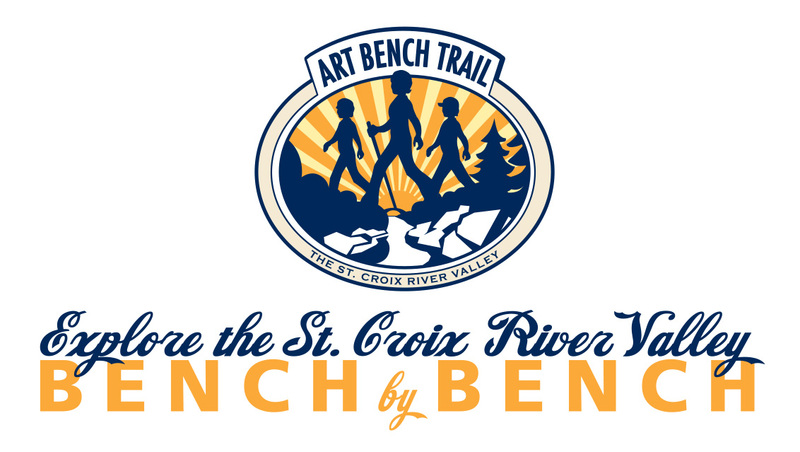 The Art Bench Trail is a partnership of The Phipps Center for the Arts, the St. Croix Valley Foundation, and the Saint Croix National Scenic Riverway. It is supported with funding from the Kresge Foundation. 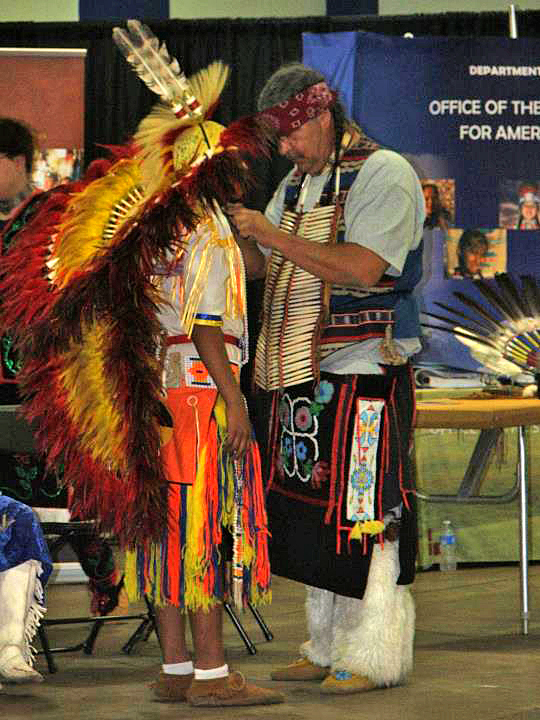 Mark Soulier (left) and a youth dancer of TRAILS Dance Troupe perform a traditional cultural dance. Medallion the Stallion, part of the Indian Summer Festival’s Horse Nation Celebration. The end of the school year means many children and parents are looking for ways to make memories and spend a day out of the house this summer. 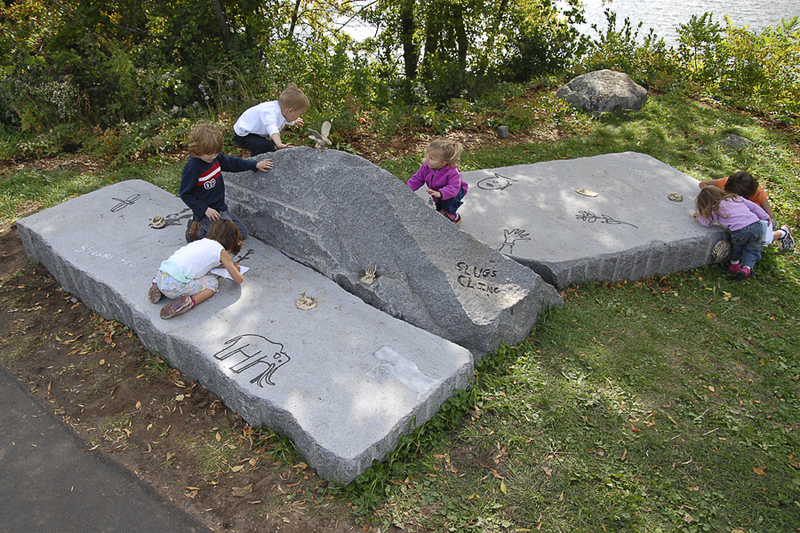 The St. Croix Valley Art Bench Trail provides easily-accessible opportunities for families to explore the area, experience community art, and get a chance at free tickets to an upcoming play at The Phipps Center for the Arts in Hudson, Wisconsin. People of all ages are invited to accept the challenge to visit all seven Art Benches during summer 2014 and upload photos from each one at www.artbenchtrail.org. Photos may also be emailed to photocontest@artbenchtrail.org. 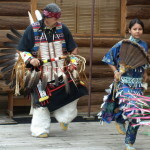 The seven unique art projects are located in communities on both sides of the St. Croix River, from St. Croix Falls to Prescott in Wisconsin and from Marine on St. Croix to Hastings/Carpenter Nature Center in Minnesota. Designed and built by students and adults, they represent the participants’ creative perspectives on the place they call home and their love for the valley’s nature and history. A map of the benches and more information about each one – including the story of its creation – is available at the website www.artbenchtrail.org. The Phipps is located 15 miles east of St. Paul. Take Hudson Exit 1 off I-94, Hwy 35 North, and turn west on Locust Street. Hudson, Wis. –– America’s largest celebration of trails on the first Saturday of June provides an ideal opportunity to explore the St. Croix Valley Art Bench Trail. 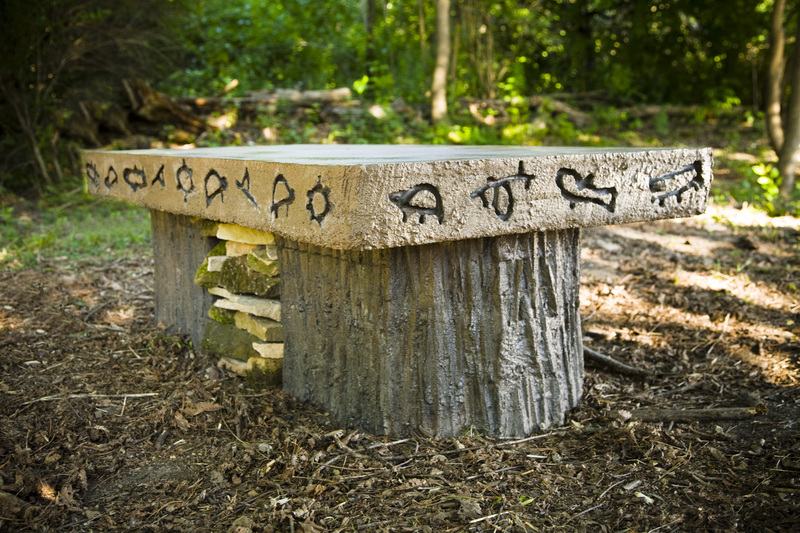 The seven art benches on the trail are all located near high-quality hiking and biking routes, making each one an excellent destination to exercise while enjoying public art and public lands. 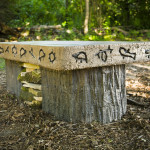 For directions to the art benches and ideas for activities to do while visiting the benches, go to www.artbenchtrail.org. “We encourage people to explore the St. Croix Valley bench-by-bench this summer, and on National Trails Day, also explore it trail-by-trail,” says Anastasia Shartin, visual arts director at The Phipps Center for the Arts. 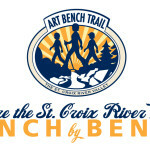 “The Art Bench Trail is made up of scenic rural routes on both sides of the St. Croix River, and connects not just the benches but many of our best hiking trails. The Art Bench Trail launched the weekend of May 2 – 4 with a festival welcoming migratory birds back to the St. Croix Valley. The trail includes seven community art projects in towns from St. Croix Falls to Prescott. Each bench celebrates the area’s nature, history, and close-knit communities. Learn more about exploring the trail at www.artbenchtrail.org. National Trails Day seeks to organize the United States’ many trails into a connected network. It is organized by the American Hiking Society and many local people and organizations to celebrate the nation’s trail system. More information is available at http://www.americanhiking.org/national-trails-day/. Stroll along the St. Croix on the city’s River Walk, which also connects with other hiking and biking trails, or explore Magee Wilderness Park, 13 acres of undeveloped land open for walking and wildlife viewing. The nature center is open to the public and offers more than 10 miles of hiking trails, including three-and-a-half miles paved for child strollers and people with mobility limitations. Willow River State Park offers 13 miles of hiking trails, including the short but steep walk to Willow Falls, a famous cascade in a 200-foot deep gorge. The 48-acre Barker’s Alps Park has several wooded walking trails along its bluffs, and a scenic community garden and labyrinth. Parnell Prairie Preserve features mowed walking paths through restored prairie, with many birds, butterflies and flowers to be seen. Walk along the river or in the prairie at William O’Brien State Park. There are more than 12 miles of trails available, including the accessible Riverside Trail. The self-proclaimed “City of Trails” offers several opportunities, including the Gaylord Nelson Riverwalk, where the community’s Art Bench is located. 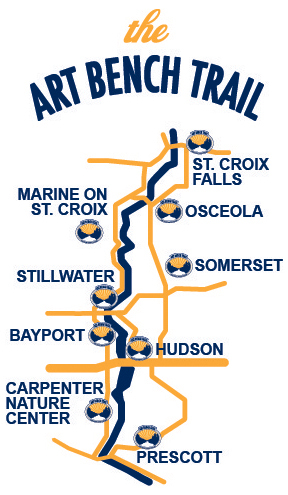 Other popular paths include the Indianhead Flowage Trail, and the Esker segment of the Ice Age National Scenic Trail. Just south of town is Interstate State Park with more than nine miles of hiking trails. The Art Bench Trail is a tourism and community-building project organized by The Phipps Center for the Arts in Hudson, in partnership with the St. Croix National Scenic Riverway and the St. Croix Valley Foundation. 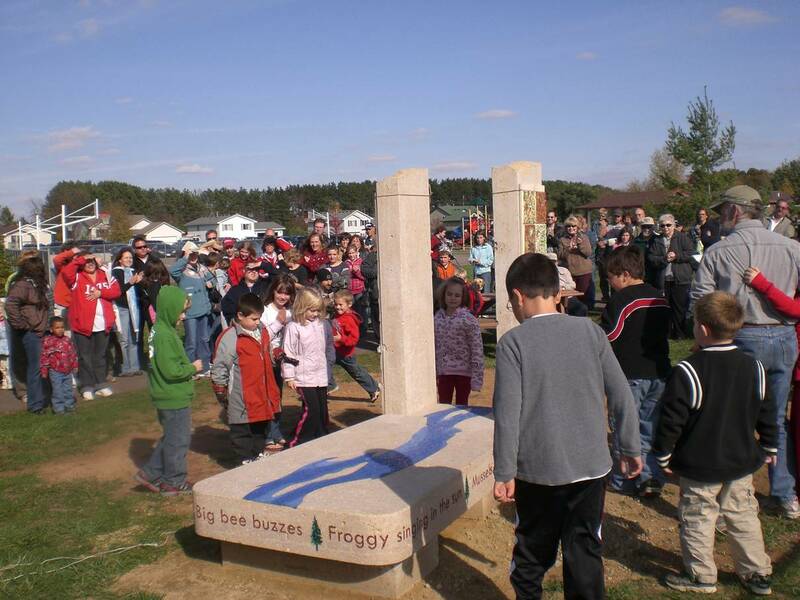 Between 2006 and 2011, seven art benches were created collaboratively, partnering youth, artists, businesses, towns, and other members of communities to create unique works exploring our connection with the St. Croix Valley’s nature, history, and culture. The Art Bench Trail is made possible with support from the Kresge Foundation. As migratory birds returned to the St. Croix Valley last weekend, area residents migrated outdoors to greet them. 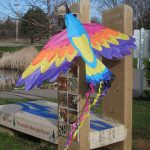 It was part of the first annual Bird Migration Celebration sponsored by the citizens group Tropical Wings in partnership with the Art Bench Trail of The Phipps Center for the Arts in Hudson, Wisconsin. The weekend kicked off on Friday, May 2 with a reception, art exhibit, and program at The Phipps. A full house of 125 enjoyed a presentation by Craig Thompson of the Wisconsin DNR, poetry readings by Laurie Allmann and winners of the Tropical Wings Poetry Contest, and an original song written by John Mueller’s students at River Crest Elementary in Hudson. The exhibit of work by students from Knapp Elementary in Menomonie, Wisconsin; River Crest; and a class from Costa Rica remains on view through May 30 in The Phipps Center lobby. On Saturday, May 3, the seven benches on the Art Bench Trail were staffed by Tropical Wings volunteers with information about neotropical migratory birds and hands-on activities centered on a different bird theme. Themes included bird banding, photographing birds, and writing bird poetry. In addition, information about a Sister Park relationship that recently formed between national parks in the Upper Midwest and analogous organizations in Costa Rica, one of the places neotropical migratory birds spend their winters, was available at each bench site. 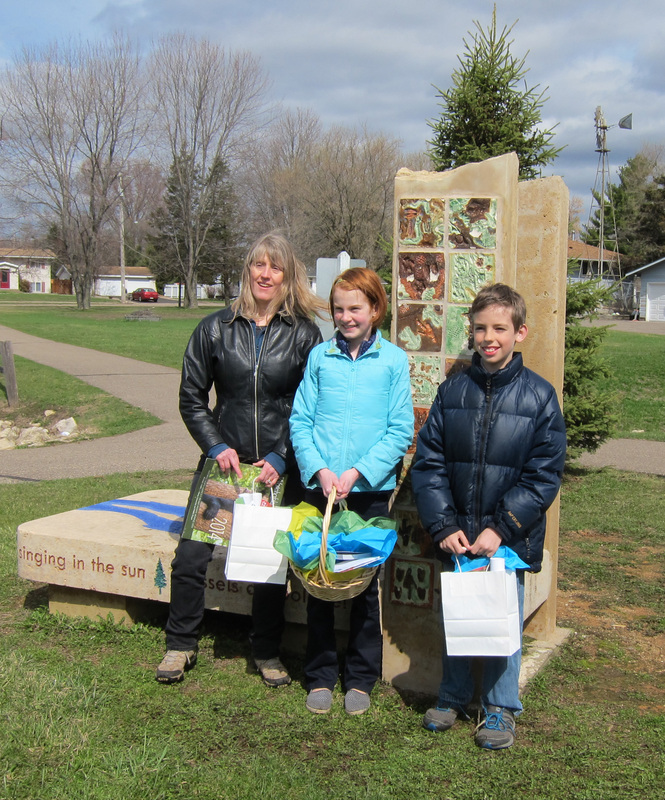 On that morning, three of the poetry contest winners and Allmann read their poems at the art bench in Larry Forrest Memorial Park in Somerset, Wisconsin. During St. Croix County’s Earth Day event at Y Camp St. Croix on Sunday, May 4, volunteers from Tropical Wings, River Crest, and the Sustainability Club of Hudson High School staffed information and activity tables. 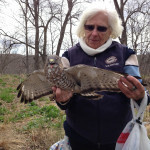 Experienced birders and Tropical Wings volunteers Patty Mueller and Nina Koch led hikes for families twice during the afternoon. During the three days of activities, nearly 800 people learned something new about these songbirds and the remarkable journeys they make every spring and fall. A total of 141 entries were submitted to the Tropical Wings Poetry Contest. The poems explore themes related to migratory birds and their seasonal journeys, the connections between birds and people, the role of birds in the community of life, and the nature of flight itself. Winning poets in the adult category are: 1st place, Lee Kisling (Hudson); 2nd place, Karl Olson (Hudson); and 3rd place, Karen Schulz (Stillwater). Winning poets in the youth category are: 1st place, Maggie Brown, age 10 (student at River Crest); 2nd place, Joey Olson, age 7, (student at River Crest); and 3rd place, Logan Carmody, age 8, (student at Knapp Elementary, Menomonie). The poetry contest was open to new and experienced poets ages 8 to108, residing in counties bordering the lower St. Croix River from Taylors/St. Croix Falls to Prescott. Judges were environmental writer and poet Laurie Allmann and Dale Cox, poet, park ranger for the St. Croix National Scenic Riverway, and 2004-2008 judge of Wisconsin entries to the River of Words International Art and National Poetry Contest. Contest sponsors extend their appreciation to all who entered as well as their congratulations to the winning poets. to us still bent at our shovels pushing back snow. that you have carried all those miles. where is true home? Or do you always just visit? The Tropical Wings Poetry Contest and St. Croix Flyway Bird Migration Celebration are collaborative projects of the Art Bench Trail (www.artbenchtrail.org) of The Phipps Center for the Arts, Rotary District 5960, River Market Community Co-op, the St. Croix National Scenic Riverway (National Park Service), and Tropical Wings, a gathering of citizens dedicated to celebrating and sustaining the migratory birds shared between the Upper Midwest and Costa Rica’s Osa Peninsula. Tropical Wings was formed in 2011 as a Sister Park arrangement was being developed among 13 national park units in the Upper Midwest and seven parks around the Osa Peninsula in Costa Rica. The group’s volunteers are active in local efforts along the St. Croix and Mississippi Rivers as well as cross-cultural/international collaborations fostering education and habitat preservation. 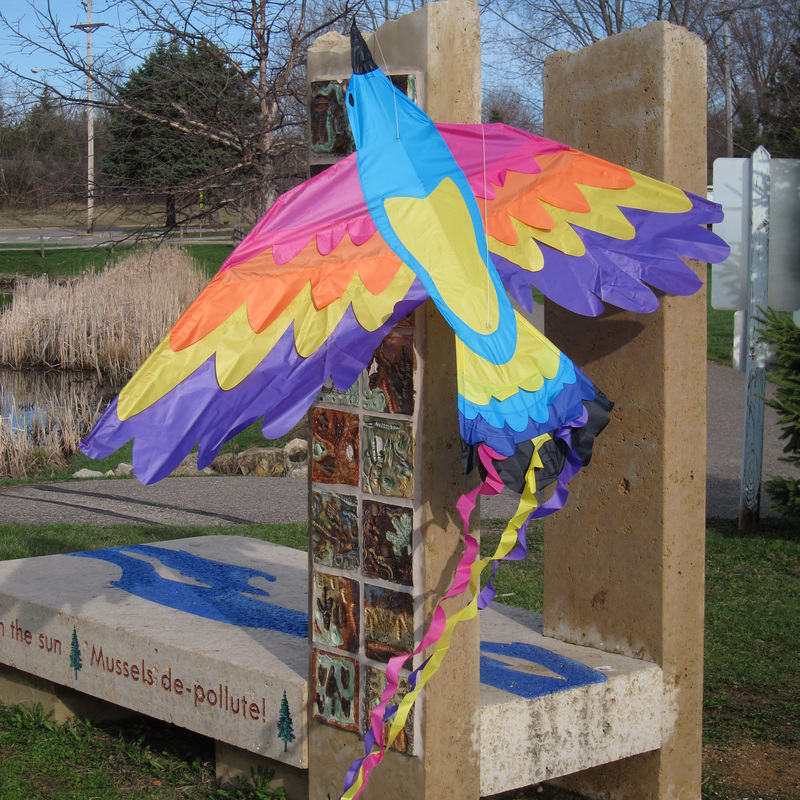 A bird kite ready to take flight at the art bench in Somerset, Wisconsin, during the first annual St. Croix Bird Migration Celebration, sponsored by Tropical Wings and The Phipps. 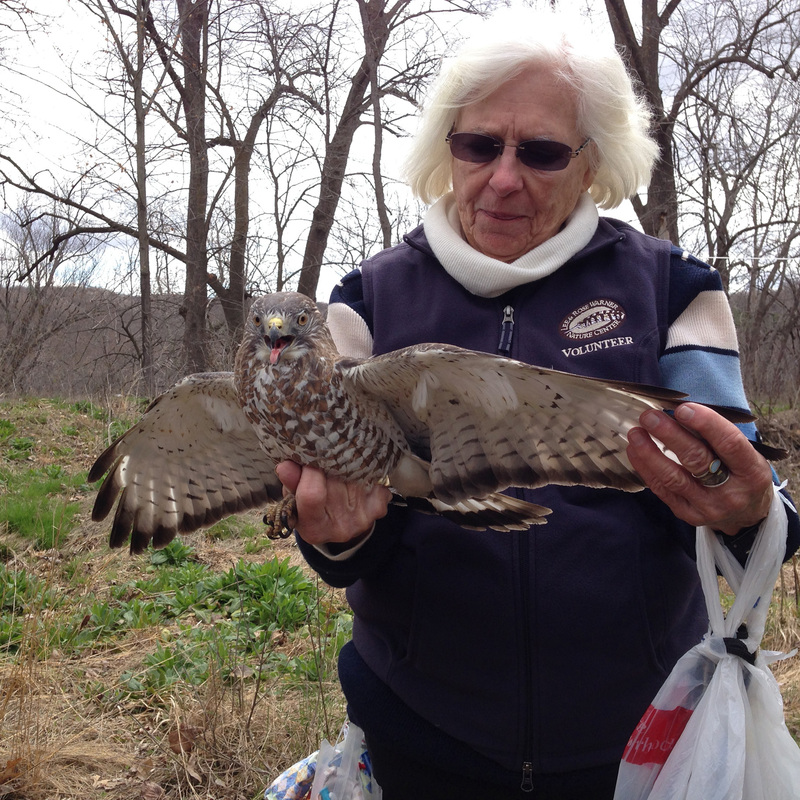 A volunteer from Warner Nature Center holds up a broad winged hawk at the banding station set up at the art bench in Marine on St. Croix on Saturday, May 3, as part of the Tropical Wings Bird Migration Celebration. 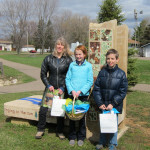 Tropical Wings poetry contest winners, (left to right) Karen Schulz, Maggie Brown, and Joey Olsen, who read their poems on Saturday, May 3, at the art bench in Larry Forrest Memorial Park, Somerset, Wisconsin. The Phipps Center for the Arts is proud to announce the launch of the Art Bench Trail. The seven public art projects linking small towns throughout the St. Croix Valley were created by community members, including youth and adults, and artists between 2006 and 2011. The Phipps has created a special website at www.artbenchtrail.org, and is promoting the Art Bench Trail through advertising and other endeavors to encourage residents and tourists to get out to see new places, and to engage with unique works of art and the surrounding communities – to explore the St. Croix River Valley bench-by-bench. To kick-off a season of activities, events, and self-guided visits to the Art Bench Trail, The Phipps is partnering with Tropical Wings to sponsor a Bird Migration Celebration May 2 – 4. On Saturday, May 3, from 8:00 to 11:00 a.m., Tropical Wings volunteers and naturalists will staff each of the Art Benches with free hands-on activities and information about the 55 neotropical migratory birds that migrate between here and Costa Rica’s Osa Peninsula, and visitors to the Art Benches that day can pick up a free limited-edition festival poster. Tropical Wings is a volunteer group that formed in 2011 to support a Sister Park partnership among 13 national park units in the Upper Midwest, including the St. Croix National Scenic Riverway, and seven parks around the Osa. The activities at each of the benches on May 3 will be unique. For example, inspired by the poetry etched around the edge of the Art Bench in Somerset, Wis., activities there will include writing haiku, creating origami birds, and flying kites, which will be available if participants don’t bring their own. At 10:00 a.m., Laurie Allmann, a poet from Scandia, Minn., will read her original poem, “Wings and a Prayer,” and winners of the Tropical Wings poetry contest will be invited to read their poems. Themes for activities at other Art Benches are Banding Birds in Marine on St. Croix, Minn.; Photographing Birds in St. Croix Falls, Wis.; Bird Migration Simulation in Prescott, Wis.; and Listening to the Birds at Carpenter Nature Center, Minn.; Birds in your Backyard in Hudson, Wis.; and Be Kind to the Birds in Bayport, Minn. For more information about the weekend of events, including a full schedule and directions to the Art Benches, go to www.artbenchtrail.org/tropical-wings/. While the Bird Migration Celebration inaugurates the Art Bench Trail, special events are planned throughout summer and into the fall, and visitors are encouraged to visit the Art Bench sites on their own, as an artful way to explore the region’s offerings. They provide gateways to the small towns of the region, reflecting the creativity of its people, and opening the door to nearby natural and historic sites, local businesses and restaurants, and parks. The new Art Bench Trail website includes an interactive map, directions to each bench, self-guided activities to do at the benches, and stories about how each one was made. The stories of the creation of each bench add depth to experiencing them, as the projects included intergenerational cooperation, hands-on learning about art and nature, and the belief that everyone has a creative spirit. Visitors to the website can also upload photos taken at each bench and have a chance to win tickets to a performance at The Phipps. The benches are diverse in design, representing imaginative ideas about places to rest and reflect, but share common values of appreciation for the region’s natural features, including its waters, wildlife, and special places, and the need to preserve those things for the future. The Art Bench Trail is a partnership of The Phipps, the St. Croix Valley Foundation, and the Saint Croix National Scenic Riverway. Many businesses and local organizations have also contributed time, energy and funding to the individual benches. The Art Bench Trail is now connecting these works of public art to bring renewed attention to them. New signs are being placed at all benches, brochures and posters will be available throughout the region, and advertisements have been placed in several publications. A new bench will also be added to the trail this summer in Osceola, Wisc. Osceola Middle School students will be participating, with involvement from several local organizations and groups. To find out how to help support this project or to get involved, call Shartin, at 715.386.2305. The Art Bench Trail is a partnership of The Phipps Center for the Arts, the St. Croix Valley Foundation, and the Saint Croix National Scenic Riverway. It is supported with funding from the Kresge Foundation. 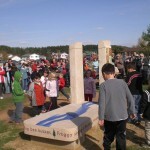 Visit www.artbenchtrail.org for more information, photos, and other resources for the public and the media. Hudson, Wisconsin – Starting next spring, The Phipps Center for the Arts will launch a new marketing campaign to encourage residents and visitors to explore the small towns of the St. Croix Valley. The Art Bench Trail will connect seven artistic benches that were created between 2006 and 2011, with up to three more benches in the works. The Phipps is leading the effort as a way to promote tourism to the region and strengthen connections between people and communities through art. 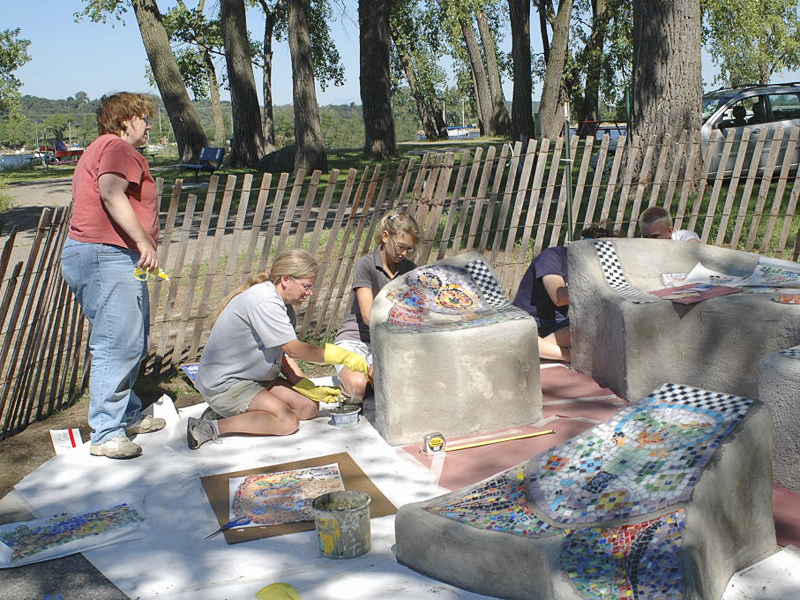 The Art Benches are community art projects which build relationships and a sense of civic responsibility among participants, and help spark appreciation for the St. Croix River and the other special qualities of each participating community. The Kresge Foundation recently awarded the project a grant to help promote the Art Bench Trail as a destination. Next spring, The Phipps and its Bench Project community partners, including the St. Croix Valley Foundation and the Saint Croix National Scenic Riverway, will unveil a website (www.artbenchtrail.org), brochures with maps, new signs at each bench, and a marketing campaign to encourage local and visiting tourists to explore the St. Croix Valley, bench-by-bench. Visiting the benches is a great way to tour the scenic river valley and visit its unique small towns. Most of the benches are located in parks that are good destinations in their own right, and the driving routes connecting them are mostly rural highways which criss-cross the valley. There are currently benches in St. Croix Falls, Marine on St. Croix, Bayport and Hastings in Minnesota, and Somerset, Hudson, and Prescott in Wisconsin. 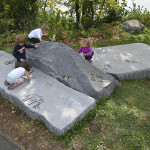 Between 2006 and 2011, the benches were created collaboratively, partnering youth, artists, businesses, towns, and other members of communities to create unique works exploring our connection with the St. Croix Valley’s nature, history and culture. Individuals or organizations interested in helping plan events or otherwise promoting existing projects, are encouraged to contact Anastasia Shartin, visual arts director at The Phipps, at 715-386-2305, ext. 103 or ashartin@thephipps.org.